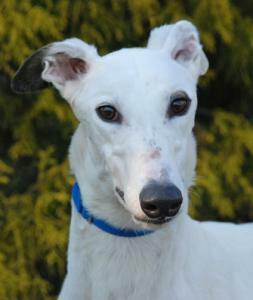 Casper just arrived from the Birmingham Race Track adoption kennel. He only has 10 races listed. Casper raced at 77lbs and is a pretty tall guy and a beautiful pure white guy with only some speckles on his ears. He is a young guy that won't turn 2 until April 15th. Casper did not pass his cat test so needs a home without cats but he did OK with a small dog that he was in his foster home with. He likes kids and loves to run so would do well with a large fenced yard. Casper's sire is Iruska All Star and his Dam is Flying Auria.